I used yellow and red peppers for mine, but you can use any color you like. If you want to punch of the heat on these peppers, you can add a pinch of cayenne or red pepper flakes. Next time I plan to serve these with my dairy free cashew cheese sauce. Yum! 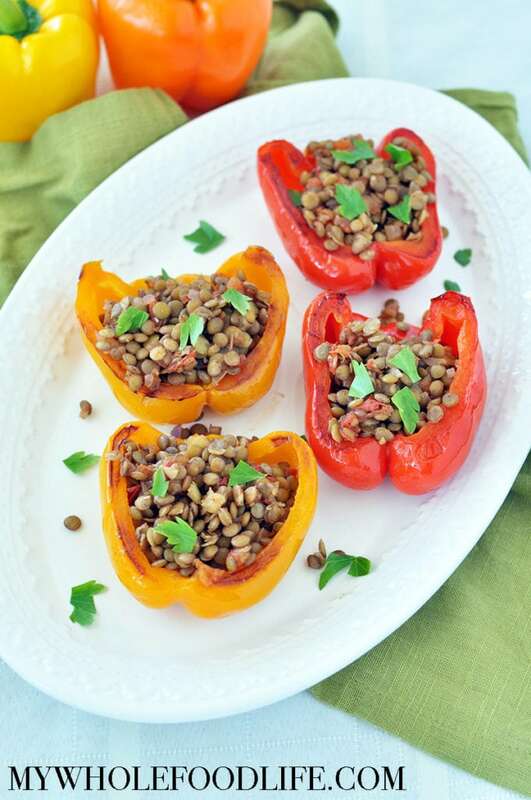 These Healthy Lentil Stuffed Peppers are sure to please. Seasoned with homemade taco seasoning so they are very flavorful. Vegan and gluten free too! Place all ingredients in a jar and mix well. Cut the bell peppers down the middle long way and remove the stems and seeds. Brush the peppers with oil, place on a lined baking sheet and bake for 15 minutes. In a small saucepan , bring the water to a boil on the stove top, add lentils, and cook on medium heat in a covered pot for 15 minutes or until soft. Drain any excess water after they are cooked. In a large saute pan , add cooked lentils, tomatoes, diced onions, and taco seasoning in a large pan and cook covered for 5 – 7 minutes on medium heat. These should last at least 4-5 days in the fridge. They may also freeze well, but I haven't tried yet. Enjoy! We doubled the recipe. The kids went back for more, over and over. They are 14 and 16. Totally a hit! Also, the filling works great in burritos, tacoas, and more! That's awesome!! So glad it was a hit!